Extra Large Stylish Home Decor,Made to Fit Your Easy Life. ALL IN ONE ---CALENDAR CLOCK,ALARM CLOCK,WALL CLOCK,USB CHARGER,TEMPERATURE,all functions are in need for daily life. Specially Designed for desk,wall,bedroom decration.extra large read-out on the wall in the living room for every family member,Featuring with indoor temperature,makes your daily life easier. Best gift for elderly and dementia patients,enable them to clearly read what day of the week today and what time it is now. Simply press DIMMER button on the top to adjust ultra-bright,slightly bright or moderately bright display as you could like. You can set three dependent alarms to wake up you in the morning ,and another two ones for your different grade children. Never worry about missing an appointment,a important show or other key event. alarm volume,alarm buzzer sound is adjustable to set for your preference. your cellphone will be 100% full of charge when you wake up,just connect it with an appropriate cable. 11.5" EXTRA-LARGE DISPLAY & 5 BRIGHTNESS OPTIONS-----Time, period of the day, full day of the week, month,date and indoor temperature in large, clear white letters on the extra-large black display,you can easily read it from anywhere in your whole house without glasses.5 brightness setting ensure you can adjust proper adjustness for your perference without being distracted when fall asleep. 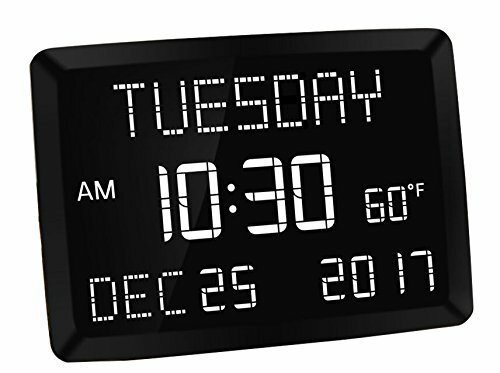 WIRELESS INDOOR TEMPERATURE (F/C) MONITOR -----Features with accurate wireless sensor measuring the current indoor temperature ,displayed in degrees Fahrenheit or degrees Celsius on easy-read large LED screen. 3 ALARMS & DUAL USB CHARGING -------it can be set up with 3 independent alarms to wake up your different family members in the morning,also can remind senior people for daily meals or for taking medications on time. Three alarm modes allow you to set weekdays alarm,weekends alarm,everyday alarm.Both USB charging ports is compatiable for ANDROID & IOS cellphones,your cellphones will be fully charged when wake up. AC POWERED & BATTERY BACKUP------- AC power is required for all functions work,CR2032 coin battery backup your setting in case of power outage,but can not replace AC power. 1 Year Replacement Guarantee / 3 Months Full refund Guarantee / 18 Months Extended Warrantly Peroid - Never Worry about returning,refund,replacement even though amazon return window is closed,just contact seller through support email,toll free hotline,website. If you have any questions about this product by Mesqool, contact us by completing and submitting the form below. If you are looking for a specif part number, please include it with your message.